1. The written examination will be held on 16th November 2018 in the DC Office and District Centre of Chirang. 2. Duration of examination will be 1 hour from 10:00 AM to 11:00 AM. 3. The list of candidates who have been found eligible for written examination, their Admit Cards have already been dispatched to their respective address. 4. The examination centre is mentioned in the Admit Card. No change of Examination Centre will be entertained. 5. All candidates are required to produce their Admit Card in the Examination Centre. Without Admit Cards no candidate will be allowed to sit for the examination. 6. No mobile phones, calculator and any kind of communication devices will be allowed to carry inside the Examination centre. 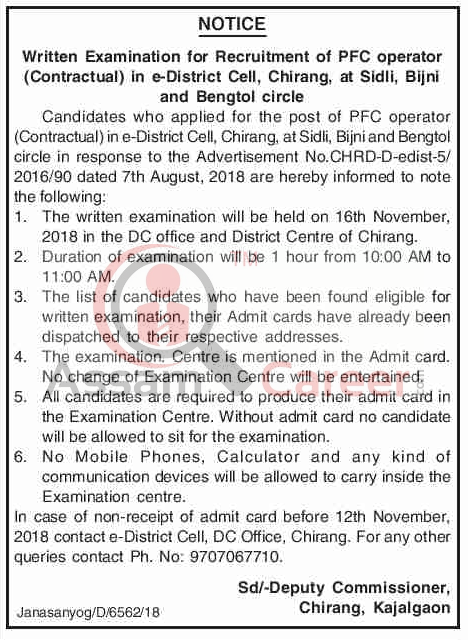 In case of non-receipt of Admit Card before 12th November 2018 contact e-District Cell, DC Office, Chirang. For any other queries contact Ph. No: 9707067710.